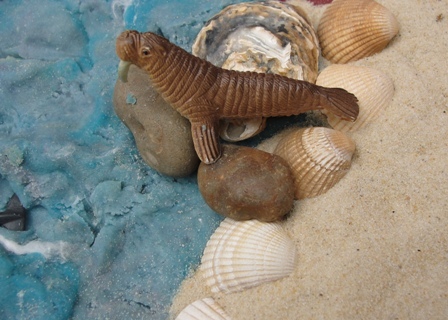 We're continuing to explore our Ocean theme, & this week we made a batch of Ocean Play Dough to use alongside our mini sea creatures & one of our favourite storybooks. To make our Ocean dough we cooked a batch of play dough & split it into three, colouring two lots with blue & green food colouring, & leaving the remaining play dough plain. Minnie mixed the three lots of dough together producing some beautiful swirly patterns, & the colours soon blended to form our ocean dough. 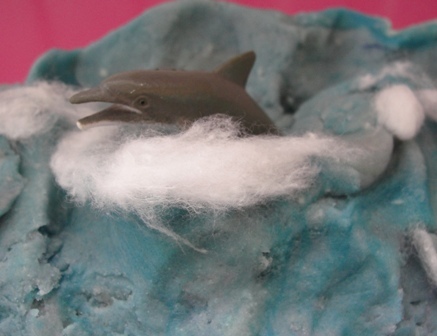 We wanted to create some surf for our sea, so added a little cotton wool. This not only gave the impression of crashing waves, but blended really well with the play dough after it had been played with again, & again! Minnie enjoyed exploring the ocean play dough, but was concerned the animals didn't have a beach, so we added a tray of sand to the play! 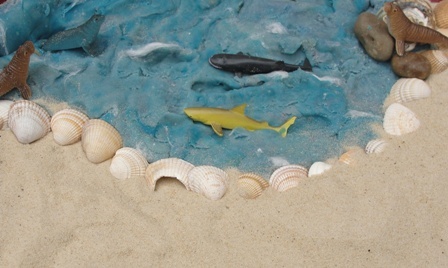 Adding a sandy area to the ocean play was useful for introducing animals that live both on land & in the sea. 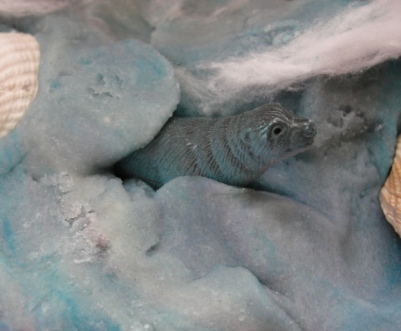 It wasn't long before the play dough was being mixed with the sand, but the contrasting textures it offered (the soft cotton wool, squidgy, smooth dough, & the grainy texture of the sand) were great to explore! Have you used music or a backing track to accompany Small World Play? Occasionally we have a piece of classical music playing softly in the background which relates to the theme of play. For example, we've listened to Saint-Saëns' 'Aquarium' when playing with our Seascape Play Area which has been wonderfully relaxing. 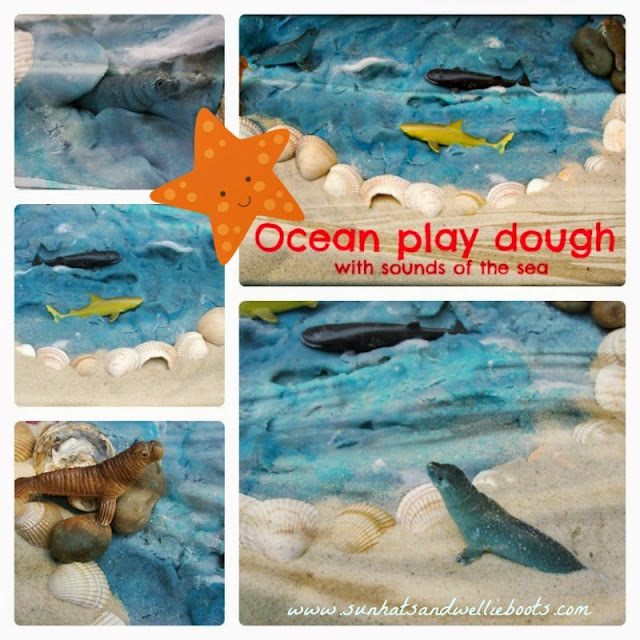 We tried something a little different when playing with our ocean play dough this time & listened to a recording of the sea. A great way to connect with the natural world. 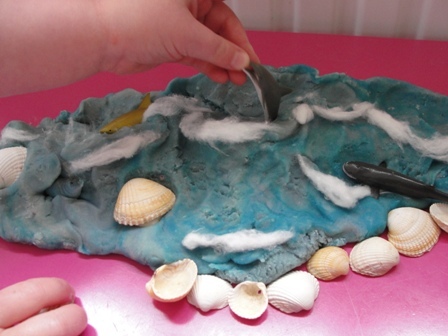 Our ocean play became multi-sensory when we added our soundtrack, & the salty play dough was perfect to represent the salty sea. It's amazing how evocative smell & sound are, isn't it? 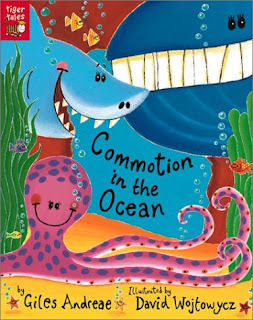 One of the books we're currently reading, & one which is a great accompaniment for any ocean themed play is 'Commotion in the Ocean' by Giles Andreae. 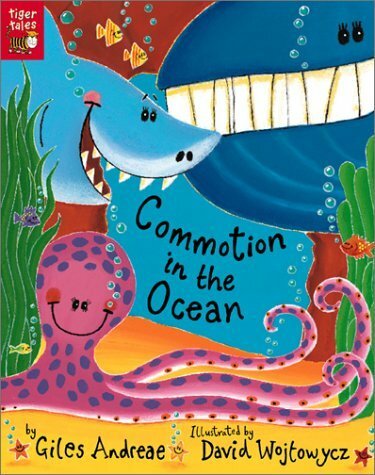 This pop-up book is full of short, fun, descriptive poems relating to a selection of creatures living in the ocean. Fun to read, with bright illustrations to explore. 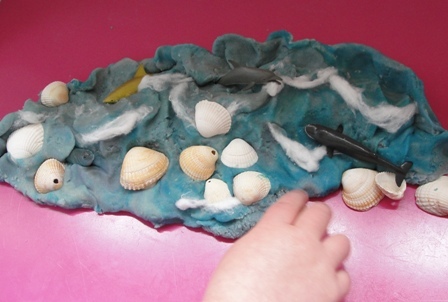 Minnie has been reciting parts of the text during her play with the ocean play dough, particularly the characteristics of the animals (the dolphins squeaking, & the lobsters clippetty-clapping snippety-snapping) as they swim & explore their habitat. 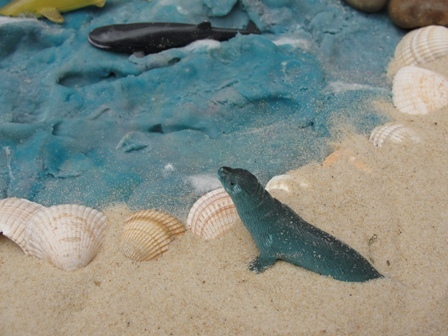 Minnie loved exploring the ocean play dough alongside the soundtrack of the sea. Now we can't wait to head off to the beach again!